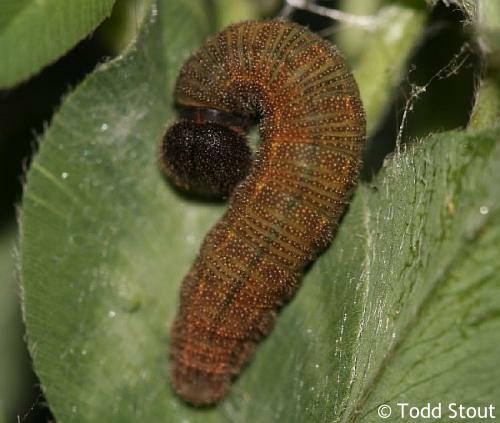 Identification: Upperside is dull brown with small pale spots. Males lack a costal fold. 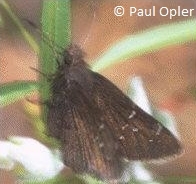 Underside is dull brown with gray scaling at margins; hindwing with indistinct dark bands. Life History: To await females, males perch in small forest openings. Eggs are laid singly on the host plant. Caterpillar Hosts: Cow clover (Trifolium wormskjoldii) in the pea family (Fabaceae). Habitat: Small openings in coniferous forests. Range: Local and scarce. South Cascade mountains of Oregon and the Sierra Nevada of California. Conservation: Seems to require open forest understory in yellow pine forests. Forest succession or replacement due to fire suppression may be a threat.